In order to help promote fire, burn, and scald prevention this year, Rasansky Law Firm reminds us to help raise awareness by educating friends and family on simple preventative measures. Most people are unaware that 140° Fahrenheit water may be hot enough to cause a third degree burn in just five seconds. February 2nd marks the beginning of the National Burn Awareness Week with numerous activities being planned for this important occasion. Every year, more than 2.4 million Americans become victims of burn injuries. From that number, 75,000 are hospitalized and treated while 8000 die from their injuries (source). This week serves to increase awareness regarding the seriousness of burn accidents, as well as to promote preventative measures which people can take to protect themselves and their families from these kinds of accidents. Scald injuries are oftentimes overlooked when burn injuries are discussed. Scalds are formed when hot liquids burn the skin. Liquids such as coffee, tea, soup, and tap water can be hot enough to give someone a serious scald injury. Most people are unaware that 140° Fahrenheit water may be hot enough to cause a third degree burn in just five seconds. The infamous McDonalds hot coffee case focused on the fact that McDonalds served their coffee at 180–190 °F (82–88 °C). 1. Keep hot liquids a safe distance from children; they tend to be curious/ clumsy and may accidentally tip over containers containing hot liquids. 2. Never hold a kid while drinking something hot. 3. Adjust the thermostat setting to ensure that the water is at an ideal temperature to avoid scalding. 4. 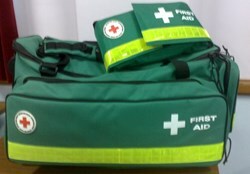 Have a first aid kit ready to help deal with minor, non life-threatening scalds. 5. Use knob covers on faucets to help protect young children and make it hard or impossible for them to play with faucets. 6. Purchase short cord appliances to prevent long cords from dangling over counters or stretching over floors. 7. Make sure to test the temperature of things like soup, oatmeal or milk before giving it to a child. 8. Never leave children unattended in vital areas such as the kitchen or bathroom. It is always a good idea to have an escape plan that you can use to evacuate your home in case of a structure fire. Having smoke alarms, fire extinguishers and practicing fire escape plans periodically with all members of the family might just prevent a tragedy.